If you’re like me, then you probably fell off the Mega Man train a long, long time ago. Time and time again we found ourselves setting out as the Blue Bomber, tasked with defeating eight robot masters before taking on the evil Dr. Wily/Doppler/whoever only to have him slip away once more. Sure, we had Mega Man Legends and Battle Network which helped mix things up, but all in all it seemed that the traditional Mega Man formula had finally run stale. 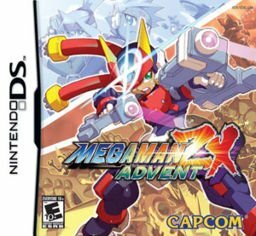 Enter Mega Man ZX Advent, an ambitious little title by Inti Creates which builds upon the traditional formula while improving upon some features we didn’t even know we wanted. Now, when I say ambitious what I mean is that this title sports everything from substantial voice acting, to an open world environment, to the ability to play as the robot masters you defeat. That’s right, instead of merely copying a power from your defeated foes you now have the ability to play as that character at any point in the game. Now, unsurprisingly, some of your alternate forms are quite gimmicky and are only usable in specific areas  while one in particular almost breaks the game. But, if it’s a choice between just playing as Mega Man and having the transformation ability, I’d choose the latter any day of the week. Another thing you might have noticed from the list above is the open world environment. In between the various levels of the game you’ll find yourself back at the Hunter Base - an area where you’re free to run around and accept missions from other characters, buy items, or re-visit previous levels. Again, while this feature is an appreciated one, it also has its setbacks – namely a lack of substance. There are really only a handful of missions to accept and you quickly find yourself with more cash than you’ll ever be able to spend. It’s a step in the right direction and in future releases we’ll hopefully see a more fleshed out game world. A traditional feature that does carry over from classic Mega Man is the difficulty. While it’s nothing impossible, I must say that quick saves and save states have spoiled me over the years. While the levels are longer than in previous Mega Man titles I’ve played, Advent does a good job of providing a challenge (especially the final level) without having you throw yourself against the game over and over to get it right. It’s a fine line between challenging and frustrating, and Advent seems to maneuver it quite well. So, you blast your way through the game, defeat the disappointingly easy final boss, and find yourself staring back at the title screen once more. Normally at this point we’d hit the power switch and say it was a job well done - but Advent throws a bit more content our way in the post game. As you’d expect, you can battle your defeated foes once more, only now the game will reward you with medals for fulfilling certain conditions in the battle, such as using only a specific weapon or damaging the enemy at a certain time. While this is all fine and dandy, my personal favorite would have to be "Mega Man a," a mini-game which has you playing an 8-bit version of yourself in what feels like a classic NES Mega Man title. Oh, and if you manage to rack up all of the gold medals from the robot masters, you can use that 8-bit version of yourself in the main game. There are really only a few constants in this world: death, taxes, and yearly Mega Man releases. The Advent series seems to have a lot going for it, and the various additions brought out in this game will hopefully continue to be improved upon in the inevitable sequels that are to come. For those of us who remember the Mega Man games as a lesson in traditional platforming action but have grown tired of the newer titles - this might be a good point to jump back in.